In the U.S., the month of April is Financial Literacy Month. For over 15 years, April drives awareness and action on the topic and Banks and Credit Unions learning and education.. Yet, some of the statistics remain alarming and demonstrate that more work needs to be done, especially with American youth. As we shared before, according to the S&P Global FinLit Survey, the U.S. ranks 14th in the world for financial literacy. Less than two-thirds of American adults passed the basic financial decision making questions surveyed. This result is even further alarming when you consider that the U.S. holds the top rankings in the International Monetary Fund (IMF) World Gross Domestic Product Outlook for 2019. 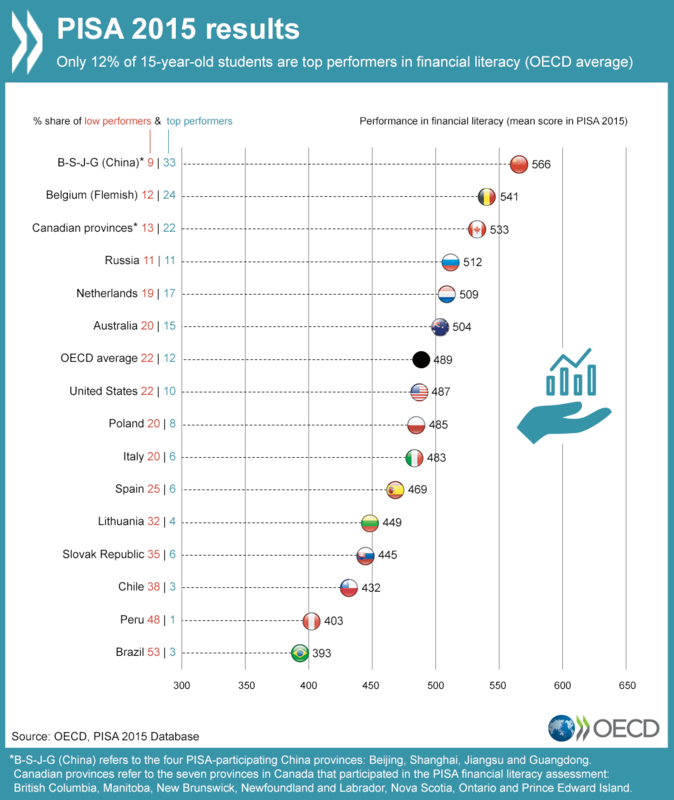 Every three years, financial literacy is benchmarked through participation in the Programme for International Student Assessment (PISA) coordinated by the Organization for Economic Cooperation and Development (OEDC). The latest findings rank American Youth in the middle, with only a 10% share of the top performers, and a 22% share of the bottom performers. Consider the important financial decisions required before celebrating a 20th birthday. From student loans, to building credit from scratch, to renting an apartment, to selecting a career, these important decisions have lifelong financial impacts. Yet to prepare America youth, only 17 states include a personal finance mandate for high school graduation and only 22 states mandate a personal finance course be offered. Of these, the standards and curriculum vary widely. Often the responsibility falls on individuals to educate themselves. The FINRA Investor Education Foundation’s National Financial Capability Study (NFCS) found that a staggering 54% of student loan holders did not attempt to figure out their future monthly payments before taking out their loans. As one of the first major financial decisions young people will make in their lives, students should research not just the amount that they’re borrowing, but the type of loan, be it federal, state or private, and what their future payments will look like with interest. While there are resources available to help youth do this research, more needs to be done. The NFCS study found almost half of student loan holders are concerned about their ability to pay off their student debt. While according to the Consumer Financial Protection Bureau, the number of consumers age 60 and older with student loan debt has quadrupled over the last decade. Studies show that in states where personal finance education is mandated, students go on to make better financial decisions, beyond their plans to pay for college. In short, financial education does work. Banks and credit unions who invest in youth financial education, be it to Millennials or Generation Z, will be rewarded with loyal customers, who have a stronger financial base and confidence in their financial decisions. At Voleo, we believe in providing hands-on opportunities to improve financial literacy. For the second year, we have partnered with Nasdaq to improve financial literacy through the Voleo Nasdaq Trading Competition, providing real investing experience to students across the U.S. You can meet some of our student ambassadors here. Beginning in October 2018, the competition runs through the end of April, Financial Literacy Month and we look forward to sharing our learnings and results. How is your organization supporting financial literacy month? We’d love to share ideas! Share your thoughts by getting in touch at support@myvoleo.com.